Taenia solium (pork tapeworm) and Taenia saginata (beef tapeworm) are two zoonotic Taenia species, with respectively, pigs and cattle as intermediate hosts. The adult tapeworm lodges in the intestines of the human final host (taeniosis) and releases eggs. The intermediate host acquires the infection by ingestion of these infective eggs via infected stool or environmental/ food/ water contamination. Ingested eggs develop into metacestode larvae (cysticerci, cysticercosis) in the muscles, subcutaneous tissue, eyes and central nervous system. The human final host gets infected by consumption of raw/undercooked beef/pork, containing viable cysticerci. Taeniosis has very little clinical implications. An important difference between T. saginata and T. solium is that for the latter human can act as a dead end intermediate host, and acquire cysticercosis upon accidental ingestion of eggs. In humans, cysticerci have a tendency to settle in the central nervous system, causing neurocysticercosis (NCC). The latter infection may cause severe neurological disorders, the most common being seizures, epilepsy and chronic headache. NCC is estimated to be responsible for 30% of cases of acquired epilepsy in endemic areas. This neglected foodborne parasitic zoonosis, identified by WHO, affects mostly developing countries, is associated with poverty, lack of sanitation and free-range pig management. Bovine and porcine cysticercosis are asymptomatic but are responsible for meat deterioration and carcass condemnation.Recent studies have demonstrated that both T. saginata and T. solium have a considerable economic and public health impact. In Europe only, millions of euros are lost yearly due to carcass condemnation, control and prevention of bovine cysticercosis. Similarly, recent studies conducted in endemic areas have shown that porcine and human cysticercosis are responsible of important economic and Disability Adjusted Life Years (DALYs) losses.T. solium has been ranked first on the global scale of foodborne parasites by FAO/WHO. However, human, porcine and bovine cysticercosis remain neglected diseases, their prevalences underestimated due to lack of accurate diagnostic tools; and there is lack of knowledge on the diseases and lack of interest from pharmaceutical companies. There is a lack of knowledge on taeniosis and cysticercosis in both industrialised and developing countries. Prevalence data on animal and human cysticercosis and on taeniosis are available but their accuracy is questioned mainly because of imperfect diagnostic tests leading to underestimations of the true prevalence of the diseases. For more than one third of the member states, data on occurrence of porcine/bovine CC and taeniosis are missing. In addition, studies on the incidence and transmission dynamics of the parasites are inexistent. Prevalence of taeniosis ranges between 0.1 and 15% depending on the region and on the diagnostic method used. 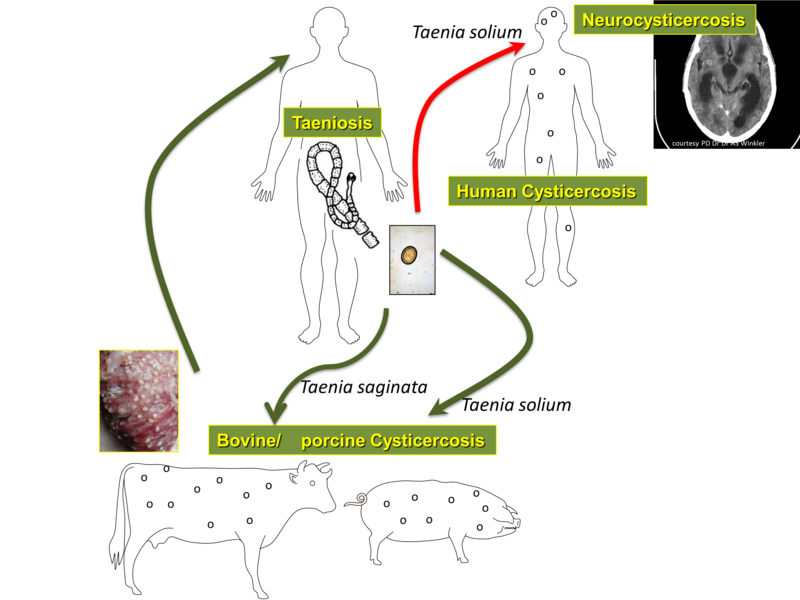 Bovine, porcine and human cysticercosis prevalence varies from 0.03 to 80%, from 0.6 to 60% and from 1.3 to 40%, respectively. T. solium was eradicated in the Europe through meat inspection (pork), improved sanitation and modern pig husbandry conditions (housed pigs with no outside access). However, like in the US an increasing number of cases is detected in the Europe, probably due to increased migration (immigration and increased travel to endemic areas). Autochthonous and/or imported cases of NCC have been detected in Spain, Portugal, France, Germany, Italy and several East European countries. In 2000, NCC has been described to be endemic in north Portugal and the western provinces of Spain. Specifically for Portugal, an evolution from autochthonous clinical cases towards imported cases has been observed. NCC cases in Western Europe between 1970 and 2011 have been recently described in a study, which determined that immigrants accounted for 53% of the cases, European travellers for 8% and non-traveller Europeans for 39%. Different clinical patterns were observed between the non-traveller and other groups. It is important to realize that; human cysticercosis is acquired by human-to-human transmission (a tapeworm carrier, mostly asymptomatic, will infect other people), without a need for the pig intermediate host; and that the number of NCC cases described probably represents only the tip of the iceberg. There is an urgent need to study and control the increased number of NCC cases now, before it turns into a serious public health problem. The latter has occurred in the US (Southwest), which was almost NCC free decades ago, but is now highly endemic. To date, European countries do not have any surveillance programme for the disease. As described above, the public health impact of T. saginata is more limited, as people cannot develop T. saginata cysticercosis. Nevertheless, food safety is essential in our society and acquiring a tapeworm of 10 meters after consumption of raw or undercooked infected beef is unacceptable. Also, the economic impact of medical consultations, diagnostic tests and taenicidal products should not be underestimated. Besides the public health impact, bovine cysticercosis causes significant economic losses to the farmers and meat sector. According to the EU legislation, bovine cysticercosis is monitored in the EU under Regulation (EC) No 854/2004 (currently under review), which describes the meat inspection requirements. Presently, diagnosis is only made by meat inspection (which has a sensitivity of less than 15%) at the abattoir, where an infected carcass leads to degradation of the carcass value (50% price reduction due to the freezing treatment to inactivate the cysticerci) or, in case of heavy infections, total condemnation. Many farmers pay an insurance to cover their losses. Despite obligatory carcass inspection, T. saginata continues to occur in the EU. Risk factors such as, wastewater effluent, sludge from water treatment plants, flooding of grazing land, drinking from effluent streams and tourism have been identified, but for now, meat inspection and treatment of personnel from infected farms are the only tools used for control. Parasitological, molecular and serological diagnostic tools have been developed for the detection of tapeworms and cysticerci in humans and animals. Some of these are promising candidates for replacing the routine, unspecific and insensitive techniques currently used in most laboratories and slaughterhouses but they need full validation and are not yet commercially available. Moreover, since cross-reactions and lack of sensitivity persist, novel approaches such as genomics, proteomics, transcriptomics and nanobody technology would generate opportunities for identification of new diagnostic targets and development of vaccine candidates. Both being zoonoses, the prevention and control of bovine and porcine/human cysticercosis need an integrated approach. Several strategies are possible to break the parasite life cycle including treatments, vaccination, health education and improving sanitation, pig/cattle management and food safety measures (see section “Working Group 3” for more details). However, studies on the cost-effectiveness of prevention and control interventions are highly needed but scarce, and this, mainly due to the lack of knowledge on the parasite transmission dynamics.